In honour of my upcoming autumnal workshop, Creature Comforts, I decided to set an inspirational challenge for myself (and for all the lovely folks who’d like to participate on Instagram). 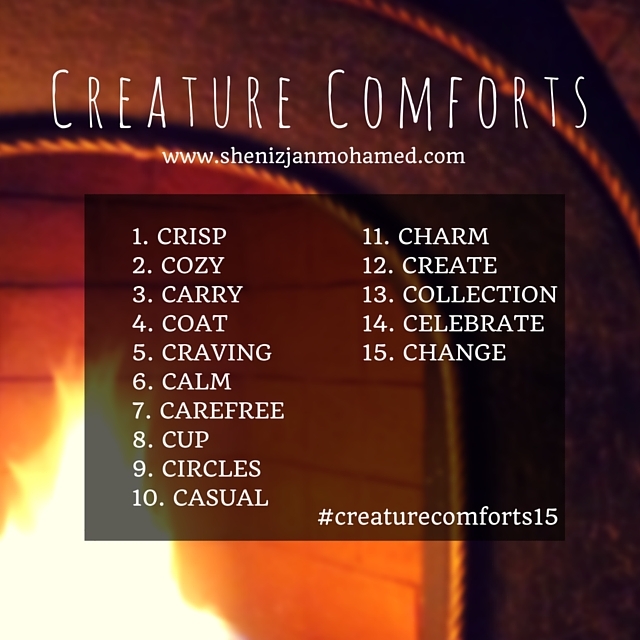 From October 1st to October 15th, I will be using the word prompts below to capture images that reflect my thoughts, experiences and inspirations related to my ‘creature comforts’. I hope you will join me in discovering your own. Feel free to participate in all the prompts, or a just a handful. You can also use the words as tiny writing prompts if you prefer. All I ask is that you sit with the uncertainty that autumn brings, and document it as a reminder for yourself and those around you.